I appreciate the flood of emails that I received regarding the folks who live next to our workshop. Yesterday was unexpectedly warm and so we thought that they were getting a reprieve. After dark I was finishing up some work at the shop (thank you Buddy for dropping by and changing motorcycle tires for me!) and noticed that they had candles. So we went to bed thinking that all was well. This morning, however, Jacksonville was greeted by record cold temperatures as the Canadian weather did indeed finally get here. For those of you who live Up North 32 degree temps don't sound like much but Down Here many people don't even own winter coats. So I'm going to try and drop in on them tonight and see how they are doing. If they haven't already moved out, that is. The city is opening shelters and I know that they have relatives across the St. John's River but as I mentioned in my previous post, when you don't have transportation and you don't have a phone (we had been letting them use our cell phones) and you don't have a radio nor a TV then any services that the City is offering might as well be on Mars. A couple of folks have said - rightfully so - that my neighbors need to help themselves. And I am not going to disagree with that position at all. I don't think they live a particularly stellar lifestyle yet I don't see them as being crackheads or alkys either. My read is that they are just some poor black folks who are really down on their luck and between jobs. But even the worst alky or crackhead doesn't deserve to freeze to death in my book. In this case I simply don't want to judge. Freezing to death or starving to death is an awfully high penalty to pay for the crime of being slack. *IF* they are slack, and I don't see that at all. Just old and worn out. Anywho, I have been very touched by the concern shown by several readers of this blog. We had our own little electrical trauma this morning. We moved the Wanderlodge to another park last night. Everything was going well until this morning. As I was packing the silver motorcycle to ride to work (yes, I am still riding in 35 degree weather!) I heard the frickin' irritating sounds of my 'puter uninterruptible power supplies going off inside the motorcoach. Which could only mean one thing. Our electrical power had died. The Bluebird has gas heat but ... duh ... we've never used it. Never had to. It just simply doesn't get that cold in Florida and in the scheme of priorities refurbishing the A/C for our tropical travels comes up first on list. We had agreed to soldier through this winter with small auxillary heaters for now. And we have discovered that one of the joys of RV living is knowing what you can - and cannot - run off of a 30amp or a 50amp circuit. Or, for that matter, a 30amp line and a Pirated add'l 30amp line at the vacant space next to you. Not like I'd ever try something like that or anything. For instance, our RV will run 3 air conditioning units on a 50amp circuit but that 4th unit will pop a breaker. And 2 electric space heaters plus the factory electric heater in the bathroom plus the hot water heater are about all that you can get out of 50amps before something goes out. One 30amp line will only run half the electical stuff inside the coach so you either need to choose between your refrigerator or your hot water heater, because they are on separate circuits. And from what I have heard you might as well forget about running the bus A/C units. With a pair of 30amp lines we have almost the same power as you do with a single 50amp circuit. Even though it's not supposed to work that way. (Our coach was one of the first built on this plan and had the bedroom remodeled once so it's not quite the spec as printed in the original typewritten manuals). Never mind the "old RV park with old wiring" factor. At our last park we shorted out half of the 50amp circuit and wound up using - with the permission of the management, believe it or not - the 50amp hookup at the space next to us. And just for the record (and for those three gearheads that have actually read this far) we carry a ton of extra cables and extension cords and poo tank fittings because we are geared up for disaster relief and Mexican travels. If it can be humanly connected, we'll find a way to do it. So no electrical power in this weather means ... frosty housecats, let's put it that way. I guess the upside to freezing the cats to death is that would eliminate their fleas, but somehow that seems to be a bit drastic. Anyway, the Ace Maintenance Man and Yours Truly pretty quickly determined that the problem wasn't in the yards and yards of wiring, switches, circuit breakers, and relays inside the bus but rather the RV park's power pedestal had gone kaput. Running on the diesel generator we had power (and heat!) but while the blasted thing puts out enough electricity to run a small ship, it's of that vintage where it's noisy and smokes like a cigar afficianado's convention. So we likely didn't make any new friends with the neighbors this morning as we ran the old Perkins diesel generator. At least they shouldn't have any mosquitos for awhile. As I sit here in my WARM office writing this the RV park is supposed to have an electrician on the way to look at things. Wish us luck. I wish that I had found this in time for Turkey Day and Christmas. Still, as it says (in Latin) on the bottom of my business checks, "better late than never." Have you ever eaten fried turkey? Mmmmmm good! But the process isn't for the faint of heart. In fact, it can be downright dangerous. 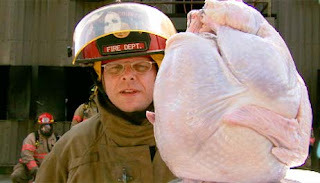 Check out Alton Brown's website at http://www.altonbrown.com/ for Alton's .PDF download showing you how to construct his "turkey derrick." Basically using simple household materials and a ladder, the turkey derrick allows you to SAFELY manage your turkey in a pot of boiling oil. Ingenious! And Brown, besides being an avid motorcyclist and a regular on the Food Channel, is downright funny. So I encourage y'all to check out his stuff.